ANAHEIM, Calif. — After getting three big homers and nine innings of outstanding pitching to complete a series sweep, the Los Angeles Angels are headed into a day off with a rare feeling of contentment in their disappointing season. The Detroit Tigers are just grateful to be going home after a horrific California road trip ended with nothing but losses. Justin Upton and Albert Pujols hit back-to-back homers in the fifth inning, and the Angels swept the Tigers with a 6-0 victory Wednesday. Kole Calhoun hit a leadoff homer and rookie Jaime Barria (7-7) pitched five-hit ball into the sixth inning for the Angels, who were in a 1-6 skid before getting back to .500 with their first series sweep — and their first shutout victory — since early June. “It’s always good to win like this, especially when you sweep a series,” Barria said. The atmosphere was quiet down the hall as the struggling Tigers packed up for the plane: Detroit scored only eight runs on its 0-6 road trip, getting shut out three times. 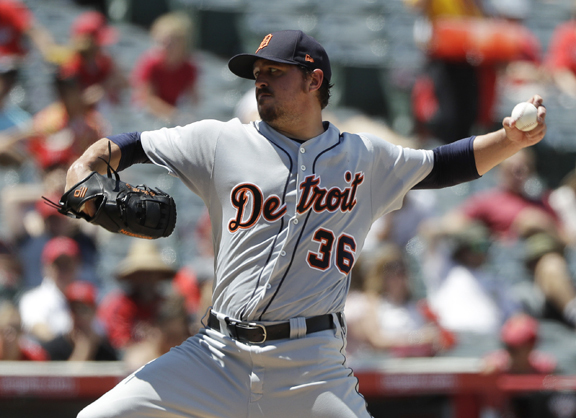 All but three of Detroit’s runs over 58 innings of play out West came in Tuesday night’s 11-5 loss to the Angels. The Angels broke it open in the fifth when Upton connected on a full-count changeup from Blaine Hardy (4-4) for a two-run homer. Moments later, Pujols added his 632nd career homer. Hardy yielded seven hits over five innings for the Tigers, who are headed home without a win on the West Coast. Detroit has lost 21 of its past 26 road games overall. Starting with three strikeouts in the first inning, Barria had another effective outing for the Angels, who have benefited greatly from his surprising emergence as a dependable starter in their injury-plagued rotation. He struck out five in total and walked one before leaving with two outs in the sixth.